In 2004 reviewing ASV�s disc of some of Thuille�s chamber music I hoped that this was "not the last we hear of the ardent Thuille". Hopes are here fulfilled and generously too; look at the playing time. That in itself would be no virtue if the music were dull. Well, it�s certainly not dull even if it cannot claim originality. The Piano Concerto is clearly written by a Schumann devotee. 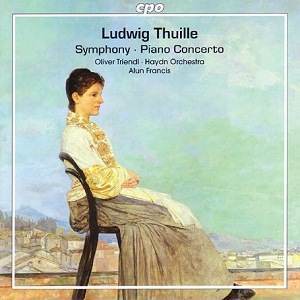 Thuille has the manner to a T and although the strings are nowhere near opulent Treindl is kept in constant and exhilaratingly joyous play over a pretty ambitious timescale; much the same goes for the symphony. The Concerto sidles in with a most adroitly lissom theme that twines its affectionate way around the listener�s memory. After a beaming and floral adagio sostenuto comes the rollingly confident and rompingly bright-eyed Allegro vivace finale with some lovely lithe Grieg-like writing for the strings at 1:30. The writing might once or twice to today�s ears seem excessively sentimental but those slightly purple patches are few and far between. The Symphony was premiered by Thuille�s young friend Richard Strauss with the Meiningen Orchestra. There are four movements of which the first is the longest. The idiom is Brahmsian - especially in relation to the first two symphonies. The Largo maestoso has some majestically dour writing for the brass (2:56). The Tempo di Menuetto third movement is pointedly Haydnesque. The finale mixes a quicksilver highday-holiday mood with more pesante writing. CPO�s notes courtesy of Eckhardt van den Hoogen are typically encyclopedic. The two substantial works here are most logically coupled and while they work within a formula they are superbly put together and will give great pleasure. The Symphony would have fit very sensibly within Sterling�s German Romantics series. The Concerto would have been a most fitting feature of the Hyperion Romantic Piano Concertos series. As it is CPO have pipped both to the post. Congratulations to all involved for such splendid and enthusiastic performances from the orchestra of Thuille�s birthplace. These unfamiliar works sound not at all stilted. Instead they flow with a pleasing inevitability. If you like the Schumann piano concerto and symphonies and the Brahms symphonies you will find this disc delightful.